From the summer of 2007 until the early spring of 2010 ..
As did the smells that filtered onto the sidewalk. The elderly woman who .. as soon as the leaves began to turn .. started baking banana bread like crazy. Oh dear .. the teacher in the yellow house must be having a long day .. clearly, there was garlic burning. Or the time the whole block of Hazel smelled like ripe apples. Or maybe someone was making applesauce? Maybe I'd passed under an apple tree? This evening .. I took a long walk through downtown Fort Collins, Colorado. Somewhere between an impromptu stop at the thrift store and a not-so-quick walk through the used bookstore .. I saw the cutest puppy coming down the block. As they approached I asked if I could pet him .. and that's when I noticed it. All of the photos were in a folder called “Kids favorite things” .. along with docs of some of the recipes we had on repeat during those years. I can't believe I'd forgotten about it after all of these years. A riff on the cheeseburger meat I made batches and batches of for my son .. way back when. He'd put it on a bed of tortilla chips .. melt cheese over the top and call it nachos. I'd put it on greens and call it dinner. 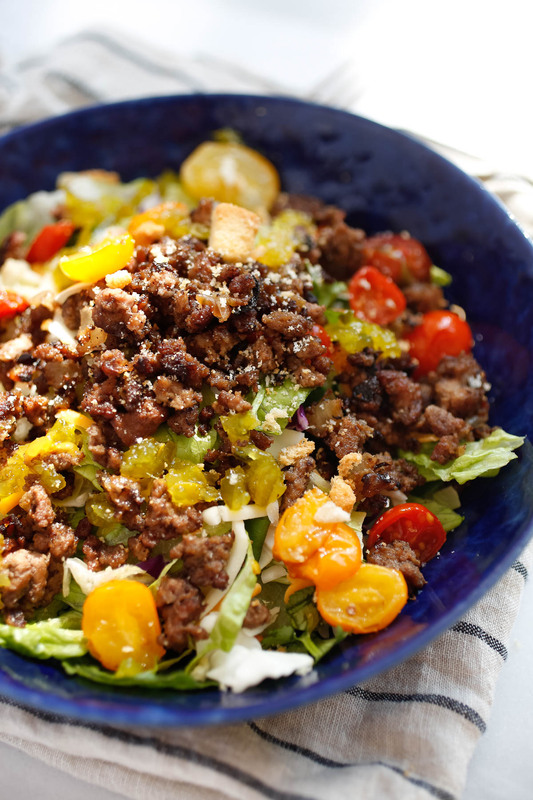 Arrange the chopped lettuce on a large serving platter, and spoon the beef mixture over the lettuce. In a small bowl, add the honey and vinegar. Place dressing in a covered container and refrigerate for several hours, stirring occasionally, allowing the flavors blend. 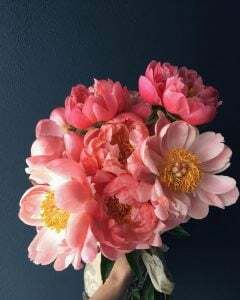 Thanks for such lovely images and thoughts. As always, I loved reading them. For me, the smell of onions, oil or fried vegetables always takes me back to a sweaty car in India going through Himachal Pradesh and stopping at a roadside stand for a cup of strong black tea. I would go back to that moment anytime, anywhere. 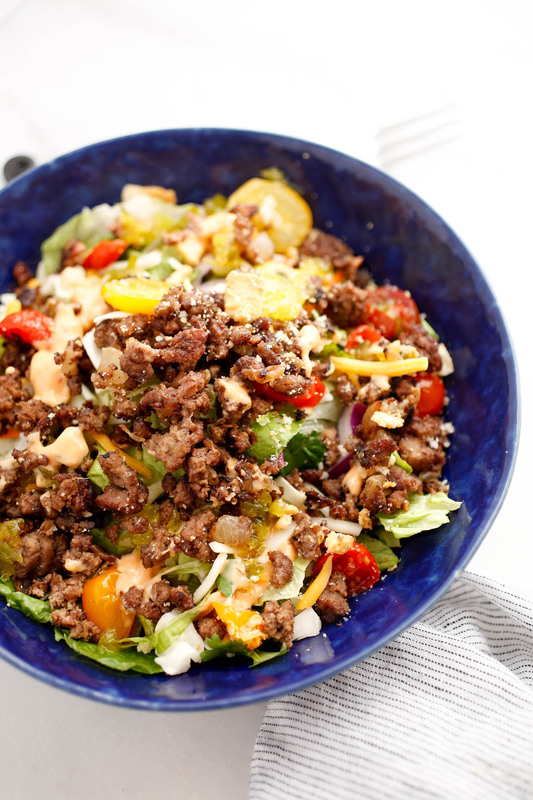 I make a cheeseburger salad that is always a winner. Something there for everyone, especially the meat for the men and I feel better they are actually eating a salad. I love reading about your memories of your old neighborhood. I’ve grown attached to several houses and neighborhoods along the way. I definitely want this salad on repeat. It will be a huge fave with the family. This salad looks scrumptious! I think everyone in the family would enjoy it. Your neighborhood sounds fantastic. I always love breathing in the different scents of people making dinner. Now this is a salad I could eat all the time. I love cheeseburgers so throwing it into a salad is such a good idea. I will definitely be trying this one. I always joke that we’re living in the house I want my grandkids to visit us in. Funny isn’t how many memories creep up after sifting through old files. 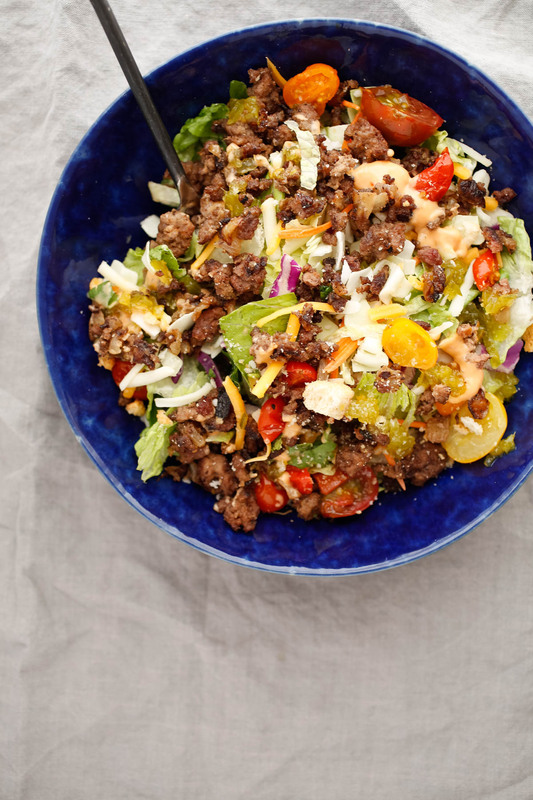 Oh, and love the recipe; I’ve had Cheeseburger Salad in restaurants before and it’s so delicious. My kids are always bringing up memories and they’re all under 12, I can’t imagine what they’ll be like when they’re older. This recipe would become an instant classic in our family. What a lovely sounding street you use to live on, there is something about having a dog that makes you get to know the area well isn’t there. I can’t believe you almost forgot this winning recipe either! This solves my desire to have a cheeseburger every night and my wife’s desire to have a salad. Win-win! Thanks. I haven’t come across cheeseburger on salad. It’s an awesome combination so you won’t feel too guilty eating the burger. The greens would be best eaten fresh. What wonderful memories. What a beautiful neighborhood. What a delicious meal. Thank you for the journey! What an awesome recipe. I never heard of the Cheeseburger Salad. Sounds delicious. I know my family will love this. I am considering making it this weekend. To date, my only comment here has been about oatmeal (I am sitting beside a gurgling pot of it now, for tomorrow’s breakfast). Your writing has kept me in such great company for four years (first while living in New York and now so thankfully back in the Northwest). I wanted to say thank you. I keep thinking it, and I’m finally telling you here. It’s just amazing how we can suddenly be overcome by memories brought on by something as simple as a smell in the air. 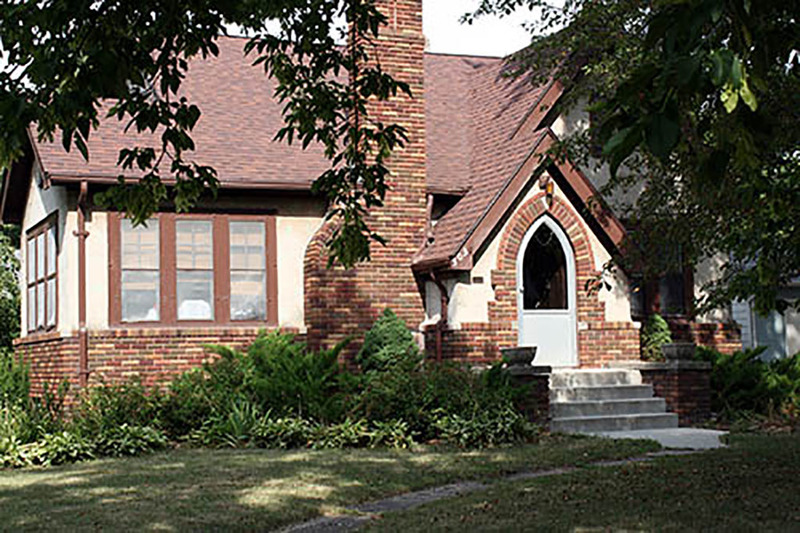 That is a beautiful Tudor style home and it sounds like it was filled with beautiful memories. I love reading food memories, especially in the blog post. Your old home reminded me my home in India. Would try your salad recipe and skip the meat as I don’t eat meat. I love the flavors of a cheeseburger and I’m always trying to make my recipes more skinny! This salad sounds like such a delicious meal. Also, I definitely become attached to the neighborhoods Ive lived in! It’s hard not to! I know how it feels with missing an old neighborhood or house, anytime we are visiting where I grew up I always like to drive by the houses I lived in. 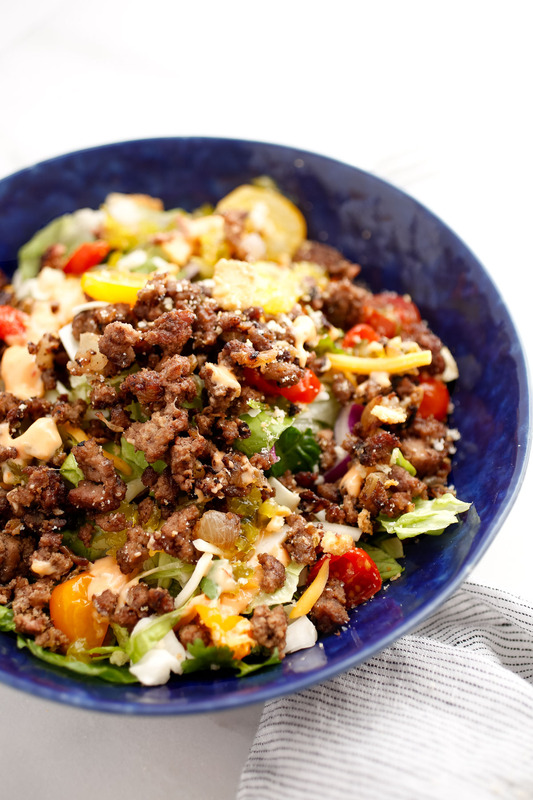 The hamburger salad sounds delicious! I have a puppy that requires a lot walking as well. While I look forward to the day he becomes an old man (he’s currently 9, how long must I wait?) with less abundant energy, I do so love that season where we walk past the glowing houses. I can remember clearly 3 winters ago when it was not so snowy and just cold and we’d walk past homes more beautiful than our own and imagine what it was like in those warm and glowing places. Houses, once they’ve been home for a bit, stay connected to our hearts. It’s strange how that happens because you don’t even realize you’re so attached. That Tudor house you lived in looked pretty awesome to me. I can imagine all of the memories that you must have had there. I have great memories of the places I lived in. Although no house as beautiful as that. 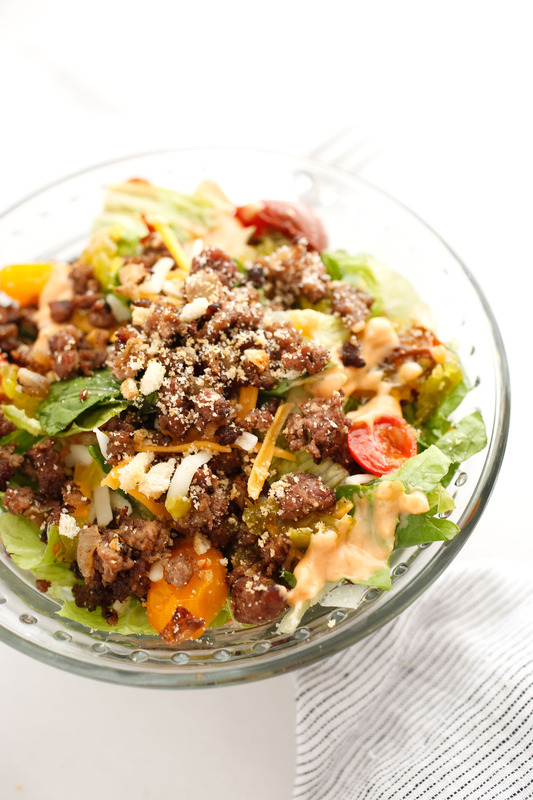 As for the cheeseburger salad, that looks awesome. I think I would rather go with the sauce that you made up. This is a great recipe! Love your story, adds more of a warmth with the idea of this meal! 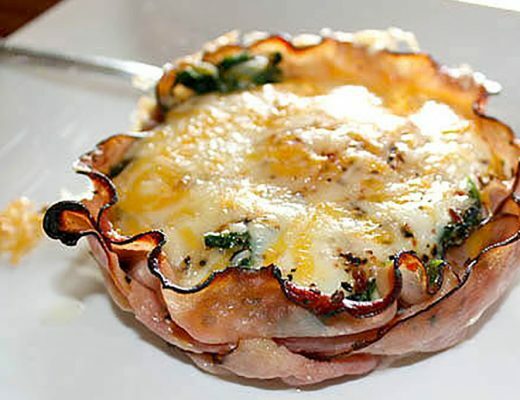 I’ve been cooking a lot at home lately and I might actually want to try this! 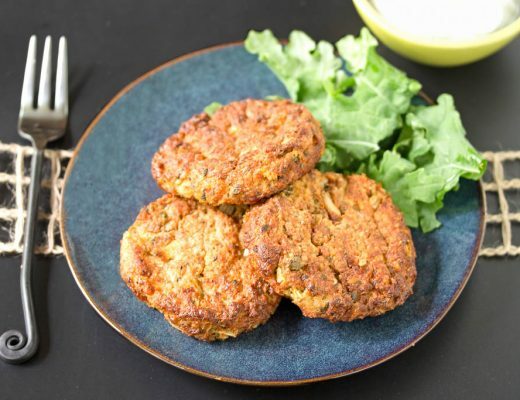 I don’t really like eating burgers because I hate the buns on the outside, but I do like the ingredients inside – I think this recipe is perfect as I love salad and the ingredients within. Yes! My grandma mixed ketchup, mustard, and chopped pickles with ground beef, served it on a bun, and called it Sloppy Joes. It’s incredibly GOOD. It sure looked like it brought back a lot of memories for you. The old house I grew up in has long in sold after we moved some 20+ years ago. Lately, I drove down the old familiar street, and our house was gone. In its place was an apartment building. The old neighborhood is now a bustling commercial area. 🙁 Even my favorite tree is no longer there. I drove past and all I could think of were memories of the fun times we had with the neighborhood kids. I’ve done a Burger Salad before! Too much fun. Since my dad has trouble handling sandwiches sometimes, a salad with all the same ingredients is a pretty good compromise. Our burger version has more mustard, no ketchup, and extra dill pickles, no cheese. ? What a beautiful old Tudor Style house! It reminds me of the houses I always used to see growing up. Driving around Vancouver I often feel like the houses are huge and vast but all cookie-cutter and look like they were made from Ikea flat-packs! That salad looks so yummy, I always like to think about my favourite unhealthy dishes and find ways to make them healthy. I have to do that now that I have a lot of food sensitivities anyway but it makes it fun too. I made this last night. We (my son & I) loved it. For anyone worried about being “healthy”, you’re halfway thru this yummy salad before realizing there’s no salad dressing. I’m a physician and for all my patients who eat salad to be healthy, they often don’t realize how quickly the salad dressing undoes the otherwise good they were trying to do. This salad somehow magically requires no dressing to be so tasty. We’ll be making again and again…. Finally a salad I can sink my teeth into, I luv this recipe and I can make the burger in batches then dd to the salad for the week, and even have it as a savory breakfast. I just came across your blog (whilst looking for ways to use an influx of summer tomatoes) and discovered you are local to me! For me, it isn’t night walks, but those in the morning, just before dawn. My neighbor at the time had five kids and from her house wafter an evocative smell of cinnamon doughnuts. Made me smile every time .. I love how easy this is! I put it together in 15 minutes or so when I wasn’t sure what to do with my hamburger I thawed. You could play around with the flavor of your favorite hamburger. The ketchup and mustard are more of a sloppy joe flavor, so if you tried more salty seasonings and different sauces, you could make it any way you like. I did this buffet style so I could refrigerate leftovers, otherwise the lettuce gets yucky if mixed in with the hamburger. Loved this!! Beautiful writing and truly lovely photos. I’m glad to hear I’m not the only one who walks the dog another block to look at the houses and flowers. That salad sounds amazing. I’m a total carnivore, so a salad like this is perfect for me and my meat tooth. I can’t wait to give this a try. Oh my, Ali, how I love this post. In my ‘olden days (i.e. my 20s) I spent a lot of time walking my beagle. He was a rescue, I’d yet to marry my husband and I lived in a tiny apartment above a coffee shop with just my dog. Every night when I got home from work, I’d take him for a walk. Much like you, during the dark months, I didn’t look forward to it nearly as much. We did the same thing, walking along streets with beautiful old two-story homes (in our case) and I’d look longingly into the glowing windows. I’m a mother now and our beagle has long since passed on. So my walks are different now with my three-year-old daughter and our miniature schnauzer, though they’re lovely in their own way. But I can’t help but reflect warmly on all those (many many) walks I took with my sweet old dog. As with so many of your stories Ali, you’ve made me cry. Sensory memories are so vivid and so very strong. The other day I stepped into an antique store and remembered the smell of our family’s cabin. When I was a kid we spent summers there and they are some of my favorite memories. Cheeseburger salad oh my. This would be a salad I’d be able to get the grand kids to eat. They want cheeseburgers every time they come over and every time I take them out to eat. Made this for dinner tonight. I used about a hamburger patty sized portion of hamburger for each of our servings (didn’t use a pound) and only enough lettuce to cover the plate. It was absolutely delicious. I put my hamburger buns in for seven minutes and they were lightly toasted. 10-12 minutes might have been too much for our oven. Tastes like a genuine cheeseburger, but a more dressed up version that feels more like a meal instead of a sandwich. We’ll make this over and over again! I’ve been told need to cut down on the carbohydrates in my life (particularly pasta and bread) to get my blood sugar levels down. This salad is exactly the type of thing I’m looking for to help improve my diet. Great suggestion! The salad sounds really good and a great alternative to the bread in a usual burger. I always find it amazing how smell can bring back distant memories in an instant and your memories are lovely. I really enjoyed reading the part of the post about your past. I love how a familiar place or smell can bring back a memory. I do that all the time! This sounds DELICIOUS and my children, who don’t eat salad, will be chomping at the bit to try this I guarantee!! I love this recipe. Last year I had it for the first time at my Pampered Chef party. Later I fixed it for my family and they loved it too. A must try! It also looks pretty on a plate. I only changed one thing, I used turkey instead of hamburger and it tasted great! 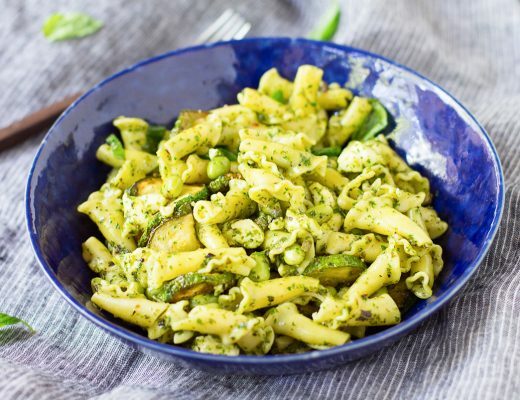 A great tasting recipe for a tasty and lovely read as always. i do love the tudor style homes, which I wish I could live in, but I guess ill have to settle for my little cottage a little while longer. That’s as innovative as it can get I guess. Hamburger fans will love the versatility of what goes in it) Seems pretty straightforward to cook too! A few random thoughts from my little corner of New Hampshire. 1. My sister calls that sent “Roasted Pine Needles” It reminds me of growing up in Minnesota, although we have plenty of them here as well. Last month my husband and I were in San Diego and there it was at Torrey Pines State Park. Do you know of it? It overlooks the Pacific. It’s so beautiful. 2. I also love looking in the glowing windows of houses in the evenings. I’m reminded of the fall we adopted out dog, Oscar, and the last nightly walk we’d take around the block. The Winter Olympics of 2006 were on. I’d walk him to the end of the block where there there was a huge house with new owners, no curtains, and the biggest t.v. I’d ever seen. Oscar would pee, I’d watch the ski jumpers through their window, and then we’d wander home. They have curtains now and Oscar’s evening walk is just outside the back door. Awesome healthy substitute for a cheesburger craving, minus the bloated after-dinner feeling. Winner! I made this tonight for dinner with ground turkey and served it with the best burger sauce on the side. It’s really hard to screw this up. Definitely going on repeat at our house!